One of the greatest challenges of blogging is knowing where to draw the line between one’s private life and public readership. It’s a bit different for everyone; I prefer to err on the side of transparency. Now, anyone who knows me will not be surprised to learn that I recognize in myself some “prickly pear” tendencies. My mom used to tease me that “Heidi” means “battle-maiden” . . . and that I’ve been living up to my name ever since. My battle-maiden tendencies notwithstanding, there are times when I worry that my “prickles” could make it hard for others — my family in particular — to relate and attach in healthy ways. And so this article provided a “teaching moment” for me to take stock. For example, as I was sitting in Mass this morning, nursing the mother of all migraine headaches, a few pews away sat someone who I could not look at without a knot in the pit of my stomach. We had become Frenemies, gradually settling ourselves in opposing camps over what should have been a common cause. This weekend’s readings — combined with themes from a Lifetime movie called Amish Grace my husband and I watched this weekend — I was challenged to reconsider this situation. Watching this Amish mother struggle to forgive the man who had murdered her daughter and two others, for the sake of her peace, I was challenged to take the first steps toward releasing the anger, and asking God to bless this person. 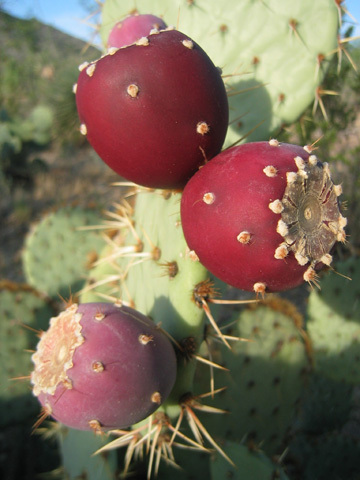 I resolved to release my inner “prickly pear,” and allow God to work as He sees fit. The choice to release resentment — that is, to forgive — is an indispensable part of growing in grace. Forgiveness is the softening agent; discretion is the solvent; and prayer, the willing prayer of relinquishment is the clean, flowing stream that washes the prickles of anger away. Is there someone in your life who brings out your inner “prickly pear”? Lord, you are the living water, the life-giving stream. You are the door of safety, the shepherd of the flock. You are the Word made flesh, the Prince of Peace. Fill up my hollow places with your abundant grace. That in our unity we may be a reflection of your love. This entry was posted in faith by heidihesssaxton. Bookmark the permalink.